I love summer for many reasons. Family BBQ's, time in the sun but most of all I enjoy spending time in a pool or just watching my own kids splash around in one. What better way to spend the summer than in a cool, refreshing pool? Nanny to Mommy recently had the opportunity to review some items from Backyard Ocean, read her full review here. 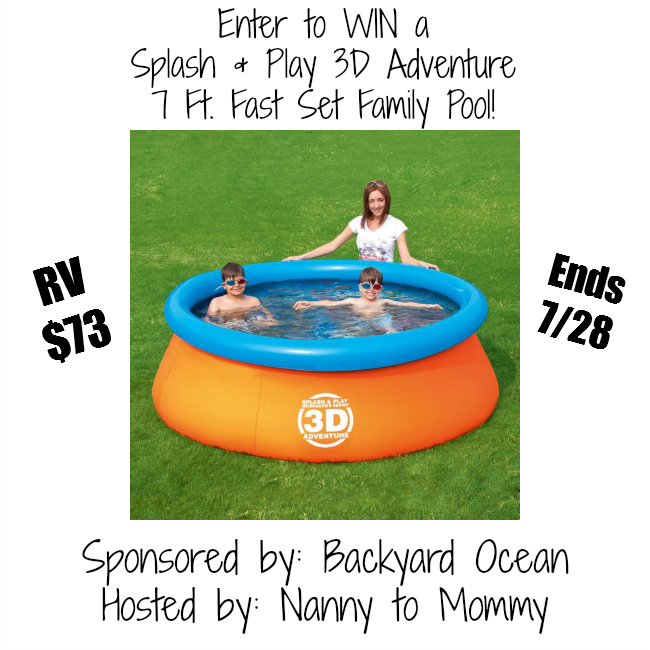 One VERY LUCKY reader will receive the opportunity to WIN a Splash & Play 3D Adventure 7 ft. Fast Set Family Pool of their very own from Backyard Ocean. This pool retails for $110, but is on sale for only $73! This pool has 3D imagery inside the walls that you can see when you wear the 3D swim goggles. Two goggles come in with the pool, more can be purchased for $24.99 in a set of two. Artisoo.com: Win one of 3 $25 gift vouchers!